The Center for Latin American Monetary Studies (CEMLA) launched the Fintech Forum in Buenos Aires, Argentina on March, 2018, with the aim to bring together the knowledge and experience of central banks of the region, international organizations and other relevant institutions, in order to contribute to the analysis and assessment of the interaction of new financial technologies with monetary and financial stability mandates. The Forum established two streams of work on priority issues, namely, the working group on regulatory aspects of fintech (REG WG) and the working group on central bank digital currencies (CBDC WG). The former is seeking to bring together the relevant experience, approaches and solutions, of the region’s central banks and the international community to deal with the regulatory challenges stemming from the new financial technologies, while the latter is studying recent experience in projects and discussions around the practical and policy implications of a sovereign digital currency, to find out the various economic and financial considerations that emerging economies must consider when approaching this issue. CEMLA provides the Technical Secretariat of the Fintech Forum and within its responsibilities it can be underlined the role to organize and facilitate communications, meetings and exchanges of both working groups. 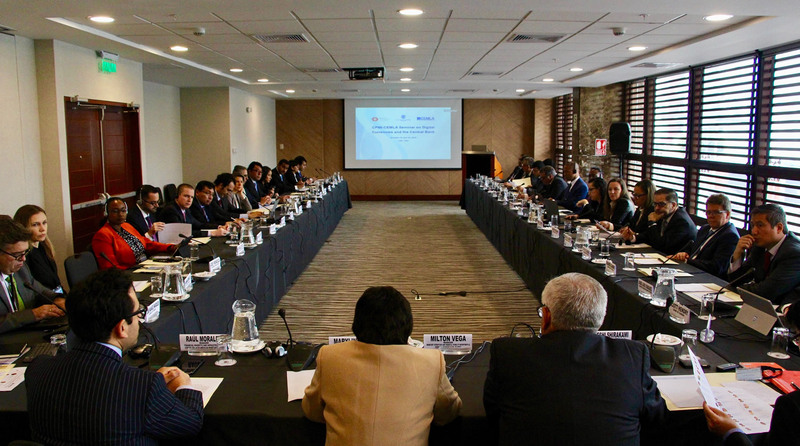 In this framework, the CBDC WG met in Lima on October 17 within the context of the CPMI-CEMLA Seminar on Digital Currencies and the Role of Central Banks. The CBDC WG Intermediate Meeting was aimed at continuing the deliberations of Group members to better understand how recent implemented CBDC projects have evolved and what lessons can be drawn. Discussions included design choices, implementation challenges and costs, policy implications and forward-looking perspective featuring relevant projects in Latin American and the Caribbean and abroad the region. The CBDC WG Intermediate Meeting also benefited from the exchange of experience held in the CPMI-CEMLA Seminar in which practical and policy aspects of CBDC and related technological developments were deeply discussed. The REG WG also met in Montevideo on October 18 to discuss findings and lessons learnt from a regional survey on regulatory expectations–and current efforts–for fintech developments, either from the perspective of the authorities and the private sector, as well as to further discuss key considerations that Latin American and Caribbean central banks should take into account when looking at regulatory responses to embrace fintech. The REG WG Intermediate Meeting was hosted by Banco Central del Uruguay and as part of the Meeting, it was organized a private-public dialogue session on October 19 in which REG WG members, banking and fintech Uruguayan representatives met to discuss several aspects around fintech and its implications for the financial industry and the central banks. The CEMLA Fintech Forum will celebrate its plenary meeting in Mexico City on March 27-29, 2019 to continue monitoring and addressing developments found and discussed by both, the CBDC WG and REG WG.